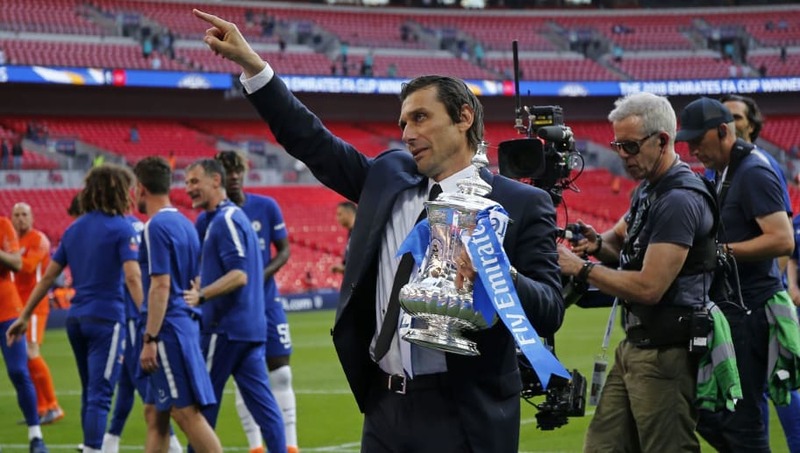 Antonio Conte has finally won his first cup as a manager after his ​Chelsea team defeated Manchester United to win the FA Cup at Wembley on Saturday. The Italian watched his men hold the Red Devils off to win their eighth FA Cup trophy after Eden Hazard coolly slotted a penalty in to score the only goal of the match. Antonio Conte is the first manager to beat Jose Mourinho in an English domestic cup final. While this may have been Conte's last match in charge of Chelsea, he did not emerge from the match a humble man and challenged the Blues hierarchy to accept his personality if they still want him. "I think after two years the club know me very well," he declared, via ​football.london. "They know me very well and if they want to continue to work with me, they know me, I can’t change. My way is always the same, hard work and to build a strong mentality with my players. I can’t change, I can't change. I am this and my past speaks very clear as a player and a manager. "You can say what you want, but I am a serial winner. I showed this in England in a difficult moment for the club after a tenth place and I think I am showing this also today as we found the right way to win this trophy and to lift this trophy." The manager also lamented the fact that the club won't be playing Champions League football next season, but noted that they should be happy to have won silverware. "I am very satisfied because today was very difficult in this moment to win the FA Cup against a really strong, a really great team in Manchester United. We must be pleased," the 48-year-old said. "It wasn’t easy but I am very happy for our fans and very happy for our players because the players have deserved this win, to win an important trophy in this season that for sure was very difficult for many reasons. "I predicted at the start of the season the difficulty of this season, but despite this we finished fifth, won the FA Cup and lost in the semi-final against Arsenal in another cup. "For sure to miss a place in the Champions League is not good for a club like Chelsea. We must be honest to tell this. Me and the players. At the same time you have to know the real situation in this the moment and understand if this group of players did their best this season and if our fifth place was the position we deserved. "But to finish in this way and to win an important trophy like this showed a great commitment and desire of my players to finish the season in the right way despite the difficulty that we have had."